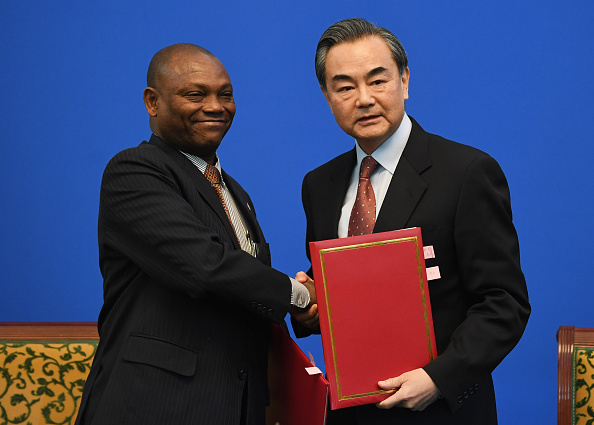 Chinese Foreign Minister Wang Yi (R) shakes hands with his Sao Tome and Principe counterpart Urbino Botelho after signing an agreement in Beijing on December 26, 2016. In this week’s episode of the China in Africa podcast, Matt Ferchen from the Carnegie-Tsinghua Center for Global Policy in Beijing joins Eric and Cobus to discuss his new paper on the perception gaps that exist around the world regarding China’s economic, military, and political rise. This is a particularly important issue in Africa where China’s engagement is highly controversial, effusively praised by some and harshly criticized by others.